I am so beyond excited! CBS WILL LAUNCH ITS PREMIERE THURSDAY WITH ONE HOUR OF "THE BIG BANG THEORY"
CBS will launch its premiere Thursday with one hour of THE BIG BANG THEORY on Sept. 26 (8:00-9:00 PM, ET/PT). The back-to-back original episodes will lead into the series premiere of THE CRAZY ONES. A whole hour of original BBT on premiere date! YAY! Oh wow!! This is so awesome! Wait, does that mean there's an extra episode this season??? Or there will be an extra week off? Wait, does that mean there's an extra episode this season??? Or there will be an extra week off? Well it didn't give any details about that. I am hoping it means an extra episode. OMG!!!!!!!!! A full hour of TBBT! I'm in heaven. And do you know what would be even better? If it actually was a two parter, I mean a one hour episode. I know they have never done it, but it would be great! I am thinking it might be, Carlos. That way they can have a full hour of reaction of Leonard being gone and have him return at the very end or something. I know they didn't want him gone long, but this way they can show him on the ship and the reactions, yet still get him back at the very end or first thing next episode. I am just excited we get two on the first night. I hope they are treating it as if it were one hour-long episode though and not taking away another episode later in the year. But for now...REJOICE! Indeed we will! Indeed we will! Looking forward to it, I do hope the episodes are better than what they gave us in Season Five. Awesome! I love it! Can´t wait! Regina King to return to BBT again! Southland’s Regina King is returning to CBS’ The Big Bang Theory. The network announced Monday that the actress would return to reprise her role as the university’s director of human resources in the upcoming seventh season of TV’s No. 1 comedy. King’s character was last seen navigating the romantic advances of nearly all the guys — including Kunal Nayyar’sRaj — as they made a play for tenure. King most recently headlined ABC drama pilotDivorce: A Love Story, which was passed over in May. TNT canceled Southland earlier this year. She’s repped by ICM Partners and John Carrabino. The Big Bang Theory’s seventh season returns at 8 p.m. with back-to-back episodes on Sept. 26 on CBS. Navigating the romantic advances of the guys? That seems a bit of a stretch. Looking forward to back-to-back episodes! I don't think they'll necessarily be directly connected, like a "to be continued" kind of deal, but they'll certainly be more or less related, as they'll probably both deal with Leonard being gone. And I would think that it means one more week of time off at some point, rather than an additional episode. LOL yeah, I wonder where they got that idea from! eta: I wonder whether they might resolve the tenure issue right off the bat in the first two eps, given she's been called back already. To be honest, it would make sense for Leonard to get it now. It would be a nice way to wrap up his trip and give Sheldon some drama. I can't imagine why else Regina would return other than the possibility of Amy getting a job there or something. But the Tenure story seems the most appropriate reason for her return. It may be that she isn't returning until later in the season as well for all we know. But I agree, I think it likely is related to that and I could see it going to Leonard. But poor Sheldon if that is the case. Amy is going to have to do a LOT of comforting, yes? http://www.hollywoodreporter.com/video/big-bang-theory-gets-mad-438745 Cute clip of the concept. So funny! Congratulations to BBT for TCA Award tonight! 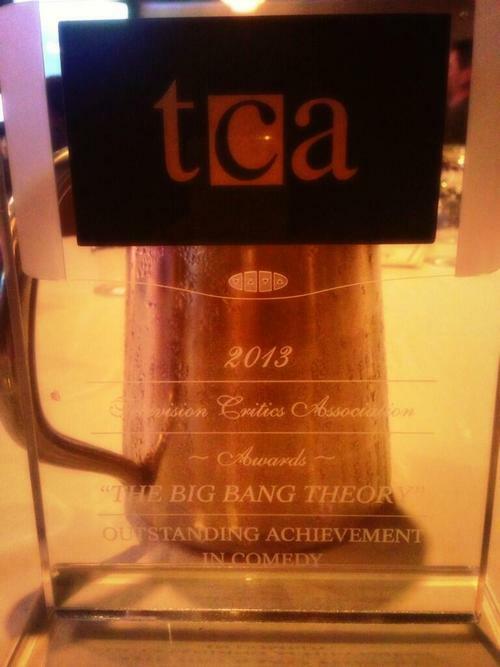 The Big Bang Theory tied with Parks and Recreation for Best Comedy Series at the 29th Annual Television Critics Association Awards (3 Aug 2013). Best Comedy Series: (Tie) “The Big Bang Theory” (CBS) and “Parks and Recreation” (NBC). I didn't recognize who Steve Wozniak was, until I googled his name, and now I'm ashamed. I should have know it!!! Steve Wozniak is the guy who made Steve Jobs Steve Jobs. Such an underrated genius. Like Tesla and Edison. Who's playing Woz in the new Jobs movie? How awesome would it be to compare notes on the show with the WOZ!